In just a few hours, almost 200,000 people will meet in San Diego, CA at the annual gathering of all things geek and pop culture. The Flickcast has gone every year since the site began in 2009 (with many of us having attended before that). 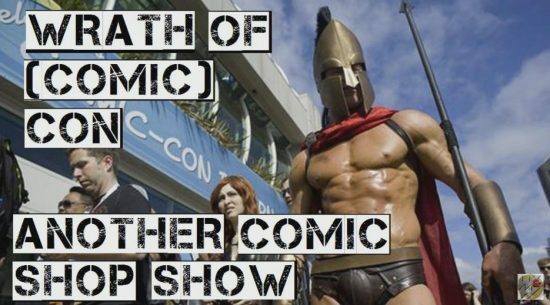 To help jog our memories and get things started, WallE and I kicked things off at Golden Apple Comics in Los Angeles last week and talked about some of our favorite convention moments. With the first story happening to Joe back in 1989 and featuring Stan Lee to WallE’s Hall H line nightmare to my encounter with Raptor Jesus (Yes, that’s a thing, watch the video), this trip down memory lane got everyone ready to experience the “grand daddy of them all” again.